There are many magical moments over the course of a wedding day and celebration that deserve to be cherished and remembered. It is likely that individual couples and people will have their own special moments to look forward and many couples are keen to celebrate the first dance. This is a high point of any wedding day as the bride and groom get together, dance to a song that mean a lot to them and take centre stage in front of all of their guests. 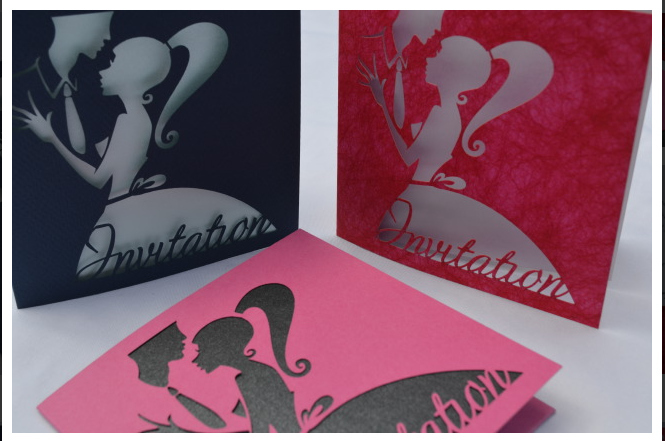 The Bride To Be wedding invitation and stationery collections draws influence from this moment with a laser cut bride and groom dancing as the front of the card. There is a chance to choose the colour of the card and the inlay paper so there is a genuine opportunity to customise the style and look of the card. Any happy couple that has a colour scheme for their big day will be delighted to know that this card and invitation set can be applied to match their needs perfectly. All of the information that needs to be supplied is contained inside of the card, leaving the front free to stand as a stylish reminder of the upcoming occasion. When it comes to spreading the good news about a wedding and looking forward to one of the most celebrated moments of the big day, the first dance is a moment that deserves some special attention and the Bride To Be wedding invitation captures this part of the celebrations perfectly, order from Infinity.